Directly executes UML, allowing declarative domain models to drive complete functionality. 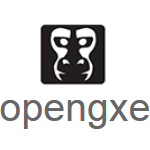 The XML model format for OpenGXE is called GXML. It helps to define entities, relationships between entities, and data, using XML.